Vincentian colleges and universities seek to create leaders, instilling in their students love and compassion, particularly for those in need. 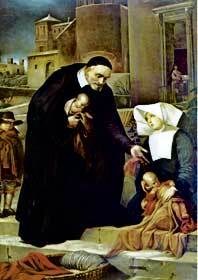 Vincentian universities are guided by the philosophies of St. Vincent de Paul (1581-1660), a French scholar and missionary. The patron saint of charity, he preached humility and sought to improve the lives of the world’s poor and destitute. Like St. Vincent, schools founded on his teachings are committed to promoting global awareness and social justice. With a special focus on each student’s value as an individual, Catholic colleges and universities go to great lengths to help students develop their talents, their ability to relate to people from different backgrounds, and their confidence. In other words, Catholic colleges prepare students for leadership, but being a leader is more engaging when involved with meaningful causes—Vincentian colleges combine leadership skills with a strong sense of purpose. Vincentian schools value community outreach and volunteerism, particularly service learning. These experiences may vary from college to college, but the activities usually involve some form of service along with enhancing an appreciation for other cultures. Students come together to distribute food to needy people, mentor school children, or volunteer at shelters and other agencies. Service also involves trips to other parts of the nation and world, where students can assist others while learning about different cultures. Higher education, though dedicated to providing a solid intellectual foundation, should also prepare students to make a difference. Vincentians believe that this is the key to breaking the cycle of social injustice, and Vincentian colleges and universities are devoted to doing just that.